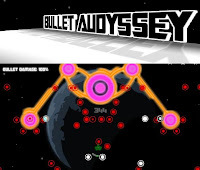 Bullet Audyssey is a new top down space shooter action game from cellar door games. Apparently, your galaxy has been invaded by enemies known as melodic celestial bodies and you have been given the task to save it. It's a rhythm based shooting game where you must survive the beat and to do so you must abosorb enemy bullets and fire them back at the enemies, upgrade your ship or fuel your bullet time skill which slows down the time making it easier for you dodge tricky attacks. This game is played with arrow keys or wasd for navigating the ship while z or space bar to shoot and x or shift to slow down time. Music is great and the gameplay style kind of makes the player feel so engaged in it. It's pretty challenging but if you seek more challenge you can go for the achievements including two secret medals. Meanwhile, we will be collecting Bullet Audyssey walkthrough videos and put them here as soon as they go live.